FORD SIERRA XR 4X4 2.9i V6 1989-85,000miles. 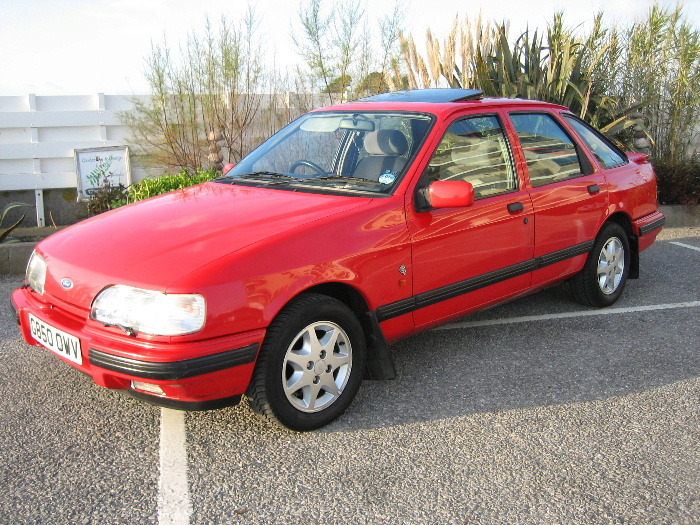 FORD Sierra 2.9i V6 XR4x4, 5 Doors, Manual, Hatchback, Petrol, 1989 G Reg, 85,000 miles, Red, 2 Owners. Central Door Locking, Front Fog Lights, In Car Entertainment, Power-Assisted Steering, ABS, Adjustable seats, Adjustable steering column/wheel, Air conditioning, Alloy wheels, Anti theft system, Body kit, Cloth upholstery, Electric mirrors, Electric windows, Headlight washers, Heated screen, Immobiliser, Locking wheel nuts, Rear armrest, Sunroof, Tinted glass.Insurance Group:14, The best we have seen,Stage 1 ECU Chip,Magnex Stainless Steel Exhaust,K&N's,Alarmed,Full and Total Service History,Bills,Reciepts,Original Sales Broschures,Air-Con and ABS were the only 2 extras of which are fitted to this car,Enthusiast owned and maintained with Total disregard of cost.This is not your usual XR 4X4,supplied Turnkey for Show or personal pleasure.